I love the rainbow brightness.So cool. This is such a fun sweater and I love that you are rocking it with such confidence. A great wintertime blues pick me up! Such a cute retro look hun! Your legs look endless in this jeans! I love this sweater so much! And the flares are like the perfect combo!!! looking so darn cute! Before I even read your caption, my first thought was ‘Rainbow Bright!’ 🙂 You look so vibrant and happy when you wear a colorful outfit. I love it! omg-I LOVE this so fun–kick winter’s boring booty! 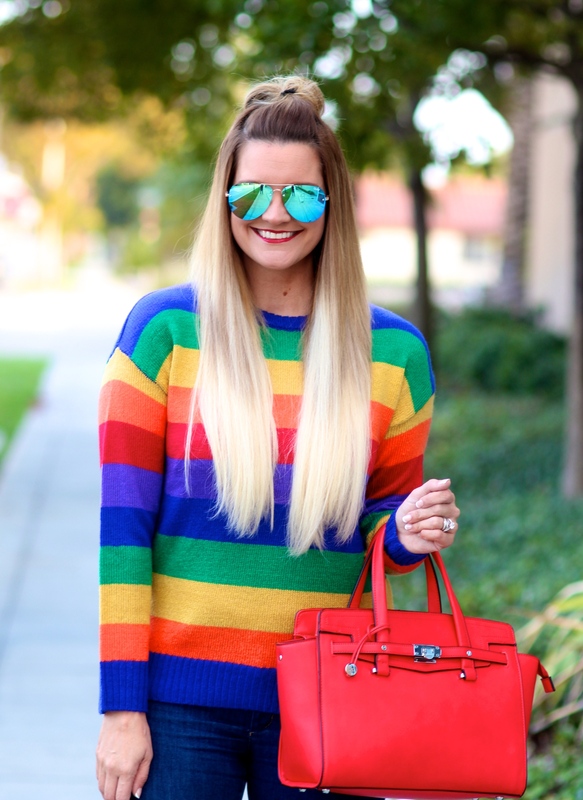 Such an amazing bright look and rainbow sweater babe! You look really gorgeous! Bright colors suit you so great and I totally agree that they are much more fabulous than black and darks! These super bright colors just made my day! LOVE this outfit–it’s so much fun and so chic! How cute do you look, Shauna! This is exactly what my Wednesday post is about — great minds think alike! So cute with the flared jeans and I’m obsessed with your hair! Have a great week! Such a cute outfit! Love that colorful sweater on you! Such a “happy” and fun outfit! That sweater is so gorgeous! It makes me wanna get some colorful sweaters myself! This could not be any more fun! I am obsessed. Such a fun sweater and the flares are the perfect pairing. Obsessed! Love this look so much! I have a similar rainbow striped sweater, but I thing ‘I need’ this one too! So so cute! Also, love how you styled it with flares! You’re adorable! WOW! I love your hair! So gorgeous.And the colors on your sweater are amazing! Those flares are absolutely fabulous! I love love love them! I would like to just live in your closet. I need this outfit. Oh my goodness, I completely love this outfit! you can pull this off so well i definitely couldnt! 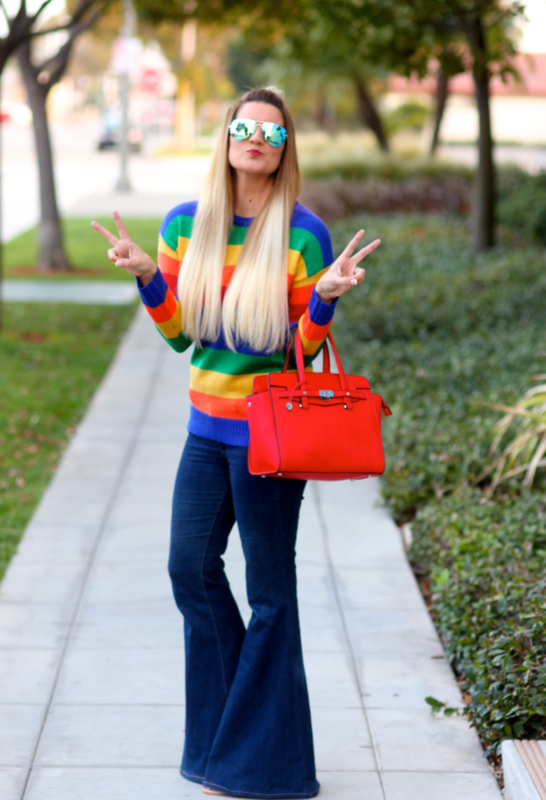 Those flares are absolutely fabulous and loving this bright sweater! 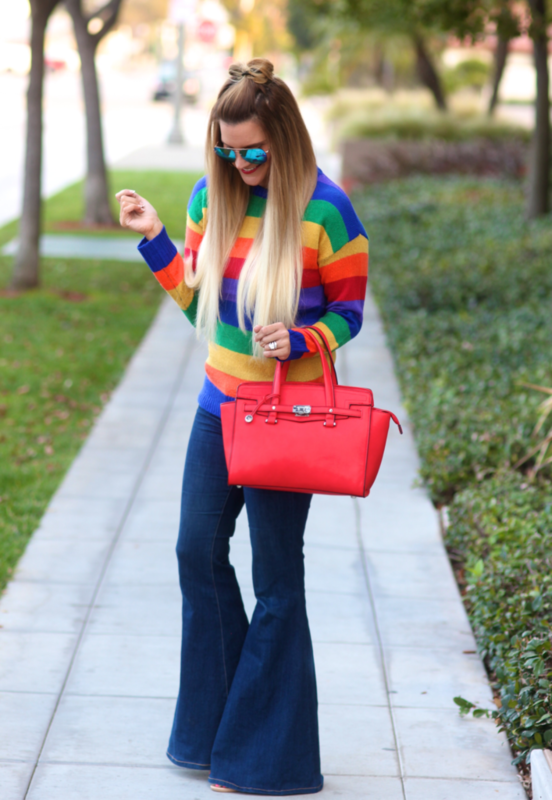 Love the bold and bright colors & those bell bottom jeans are perfect on you! I love the way you styled your hair! Couldn’t love this look more!! Your sweater is so bright and colorful and you hair is FLAWLESS!! Gorgeous lady! Oh my gosh you are rocking this! Rainbow Brite was the best!! 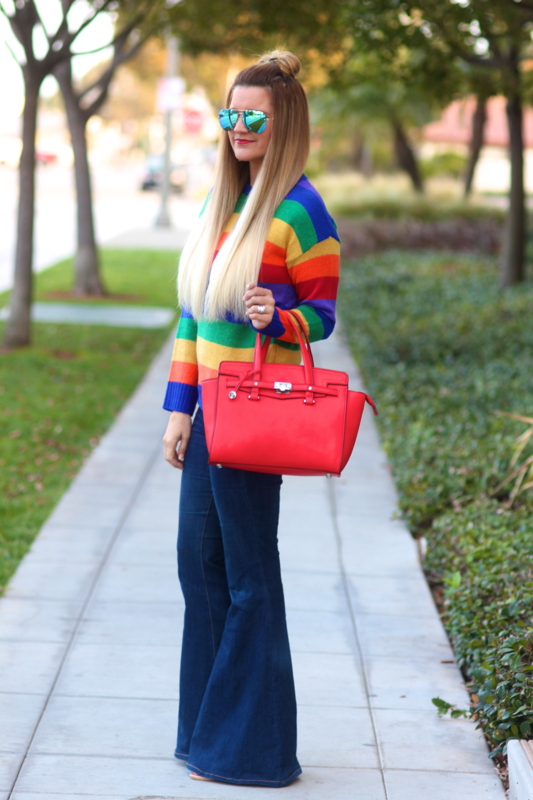 Love that rainbow bright sweater and that gorgeous purse! Stunning Shauna! This is such a fun outfit. I love the sweater. Simply stunning! You look incredible! This sweater is so bright and happy! Girl, you are wayy too cute in this look! I love that fun sweater and that gorgeous bag ! Also, your hair has gotten sooo long and I am loving it! Love this!!! You always too so flawless!!! This outfit is so fun! Definitely brightens up this gloomy January. I love this fun 70s vibe! What a great sweater! Omg, I love, love, love your sweater! And with your flared denim too, it’s so fabulous! Spring is just around the corner and I like you I can’t wait. This look is so cute and fun! I’m obsessed! Those flares are esecially amazing – def the perfect pick me up for a dreary day. These bright colors are so amazing! Love the ultra flared jeans! I love it when people wear bright colors in the winter. All the neutrals and jewel tones get so boring. You look like you had a lot of fun with this outfit. Such a fun jumper! The perfect way to brighten up a gloomy Winter’s day! This is such a fun outfit, Shauna! Those jeans are FABULOUS. OMG stop! This is the cutest!! RAINBOW BRIGHT… childhood though!! How fun is this 70s look! This sweater and the flared jeans are amazing! So cute, we love this outfit. This look makes me so happy! I love the bright colors on you, and those flares are perfect! This look is so fun! Loving the bright colors & those flares are perfection! You look great babe! This sweater is everything , but hose flare jeans though! You look amazing in this uber stylish look! So darn cute!! Love this bright and cheery look and those jeans are awesome! Wow, I imagine people turn heads when you pass! Amazing!